Founded in 1876, the American Library Association (ALA) is the oldest and largest library organization in the world. The War Department’s Commission on Training Camp Activities extended an invitation to the ALA to provide library service to soldiers and sailors in America, France, and several other locations. 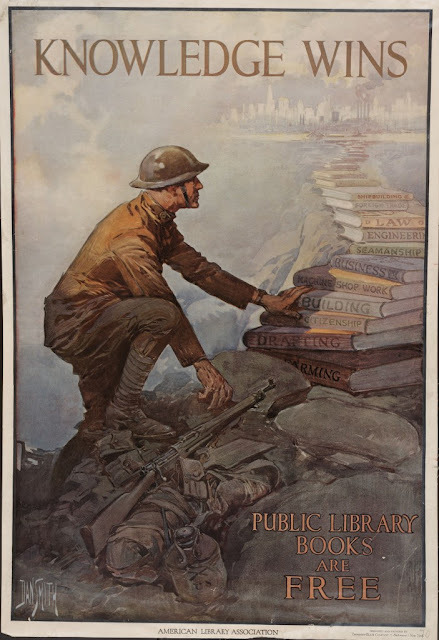 In 1917 the American Library Association established the Committee on Mobilization and War Service Plans, later known as the War Service Committee. ALA was among seven welfare groups associated with the Commission; together, they were often referred to as the “Seven Sisters”. The other partner organizations were as follows: Young Men’s Christian Association, Young Women’s Christian Association, Salvation Army, Jewish Welfare Board, Knights of Columbus, and War Camp Community Service. Every library in the United States was urged to participate not only as a collection site and repository for donated books, but as a source of promotion and publicity for the campaign. Librarians were encouraged to join the “Dollar-a-Month-Club” whereby they contributed their own money to the cause. Library staff catalogued books and placed a War Service label in the front cover and circulation card in the back. Volunteers were solicited to sort, pack, and ship the materials to military members at home and abroad. Citizens were invited to place a one cent stamp on the cover of their magazines and place them in the local postbox to be mailed to our servicemen. In a 1918 letter Salvator Cillis, a soldier at Camp Upton, Long Island, writes: “You have no doubt seen the little notice printed on all the periodicals, about when the reader gets through to put a one cent stamp and it will be sent to soldiers and sailors. Well in one corner of our barracks there are several piles of them…” His accompanying sketch (page top) brings the scene to life. Cillis continued to send heartfelt, humorous letters with sketches home to his friends and family, even during his time in the trenches. Hmm. Odd symbolism in the image provided (unexplained, and also undated/unreferenced, so I will give my interpretation). Solder is not holding his gun, and there is no bayonet or gas mask or similar artifacts of infantry. Somehow abandoning these things was important? The end of the literary chain I suppose is "civilization" which has the appearance of the NY skyline. "Farming" is at the bottom of the heap, yet food was an essential (and often missing) component at the battlefront. I presume there is a lot of room for interpretation of the image provided.